Three resources in one ? READING, WRITING, and ARITHMETIC! Learn how to take the mystery out of teaching the early grades with this practical, down-to-earth guidebook from Ruth Beechick. The book is divided into three sections that are tabbed for easy reference. The READING section tells how and when to begin phonics, and how to develop comprehension skills. The LANGUAGE section shows how to develop written language skills naturally, in the same way children learn oral language. 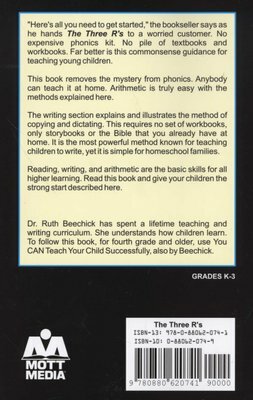 The ARITHMETIC section explains how to teach understanding of math concepts, and not just memorization of facts. An excellent resource for homeschool parents of foundation phase children. Ruth Beechick is pro-homeschooling and tells you how to do it in her simple no-nonsense style. This book is not long, but filled with useful information. Her tips for math, reading and writing are widely used and work and she does not require you to buy expensive curriculum to implement them. In “A Home start in Reading” the phases of reading namely prereading, beginning reading, blending, decoding and then the fluency stage is explained in detail. The vowel and consonant charts for the English language is also given. One understands then that to learn to read, one must read….there is no other magic formula for reading. She also explains that the reading skill and writing skill grow together and must be encouraged as such.This means that it is a good thing to let your child read and write every day – just a little each day, but every day.Writing can be learned very effectively by copying and later on by dictation. The book also helps one to understand that the Fluency stage is something that will differ for each child individually and cannot be hurried, it can take weeks, months or even years. In the book “A strong start in language” she helps us moms to know that all over the world children will at times complain about writing, because writing is hard work. She highlights that knowing grammar does not imply good writing, but students who are good writers can learn grammar better than poor writers.Creative writing is encouraged as a child has something to write about, but it is specifically stated that it is not a good idea to require too much original writing too often. Some grade level guidelines are provided (Gr1-3) for language skills. Spelling is also discussed and advice given on how to approach spelling in the primary years. 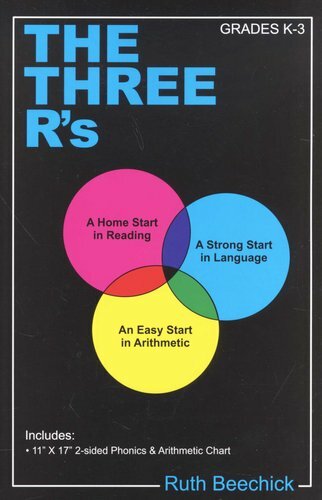 For me the best thing about “An easy start in arithmetic” was to learn about the modes of learning mathematics – growing from the manipulative mode to mental image mode to symbolic (abstract) mode. One is usually forcing children to ‘do maths’ too quickly in the symbolic mode without a good foundation being laid in the manipulative mode. She strongly advices parents to be more patient with their children and not rush them in this important skill. The good news is that maths is all around us and it is very easy to let a child do manipulative maths in and around the house. Games are also a great easy way to let a child develop his manipulative and later on, symbolic modes. Grade level guidelines are provided for Grades 1 to 3.